ScotRail is adding extra carriages to some Borders Railway services after complaints of passengers being unable to board trains and overcrowding. A number of customers have raised concerns about the two-carriage provision on the line. ScotRail said it had tried to allow for the "novelty factor" of the Edinburgh to Tweedbank route but the level of interest had been "remarkable". Passengers posting on social media said they had been "packed like sardines" or unable to board some services at all. The company said it was doing its best to try to tackle that situation. However, it said the demand in recent days - particularly from families "making a day of it" at weekends - had been considerable. A spokeswoman said: "We are continuing to monitor passenger numbers so we can tailor how to make best use of the carriages available to us. "For example, we may have found a way to temporarily double the number of carriages on a Sunday, and aim to do the same on Saturdays during peak times. 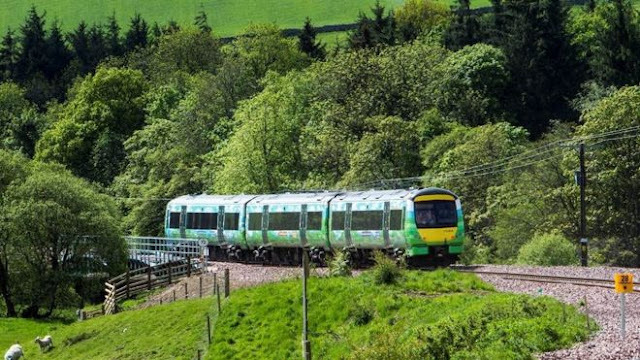 "We are also planning to add carriages in the short term to one particularly busy service, the 16:24 from Edinburgh - Tweedbank which is key for commuters." She added that the route was going to be very popular with "commuters and leisure travellers alike" and ScotRail remained committed to achieving the best balance so that customers had an "enjoyable experience". The Campaign for Borders Rail said it had repeatedly warned that there would be "much more demand than was being planned for". "We are delighted that the Borders Railway is already proving sceptics wrong, and that is to be celebrated," a spokesman said. "However, we raised the issues of underestimating demand with the Scottish government and its Transport Scotland agency in advance of the opening and even before track laying commenced." He said the "remarkable" demand did not come as any surprise and that his organisation had been assured all trains would have extra carriages in initial weeks but that was "clearly not the case". "Were it not for the general shortage of trains, adding more rolling stock would be relatively easy - although we would not countenance the inconveniencing of passengers elsewhere," he added. "The difficult part of the solution is the building of sufficient infrastructure - principally more double track - which was omitted on grounds of cost from the original specification. "Our often repeated concerns over building structures which deliberately constricted the railway - such as road overbridges which permit just a single rail track to pass underneath - will become apparent sooner rather than later."